For the month of April the Boston Wine Exchange is offering 15% off all non-sale wines. This is the discount normally applied to mixed-cased purchases and presents a nice opportunity to pick up a few bottles without having to stretch to a case to get the best available pricing. I had a chance to visit the store last week. It looks to be a nice downtown store that mixes value-oriented wines from all regions with a nice selection of special occasion wines. Overall, pricing looked competitive with well-priced suburban Boston retailers. If you visit, be sure to check out the back of the store where they keep their nicer wines and their wine tasting machines. I couldn't pass on a bottle of hard-to-find 2005 Cakebread Cellars Benchland Select. Offered at $85 (after 15% off) it was priced well below the best price nationally on Wine-Searcher. Check out this post from The Passionate Foodie for a nice overview of the store. Add them to the growing list of Boston-area wine shops on Twitter. 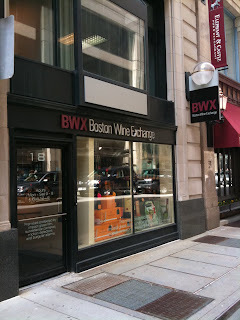 Question of the Day: Have you been to the Boston Wine Exchange? If so, what did you think?